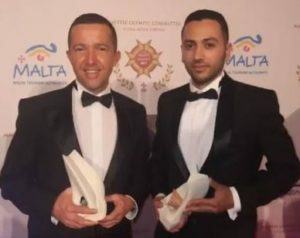 The Malta Table Football Sports Association had a successful evening at the Maltese Olympic Committee Awards this week. The evening was held at the Corinthia Palace Hotel in San Anton, hosted by local sports journalist Mario Bonnici. The Maltese Open Table Football Team of Angelo Borg, Hansel Mallia, Massimo Cremona & Samuel Bartolo was presented with a Bronze Award for their efforts in being Semi finalist in the FISTF World Cup in Paris this September. Massimo Cremona and Samuel Bartolo, members of the Open semifinal team at the FISTF World Cup. Massimo Cremona also won a gold award for his victories on the FISTF circuit in Scotland, Greece and Austria. A total of 103 athletes across a range of sports, from snooker, bodybuilding, canoeing, cycling, triathlon and table football were honoured with this year’s awards. 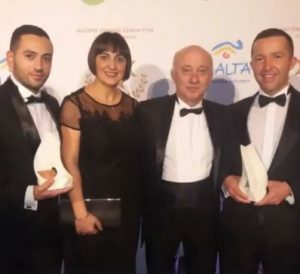 Samuel Bartolo, Monalita Balzan (Malta Table Football Sports Association Public Relations Officer), Joe Zammit Pavia (President MTFSA), Massimo Cremona.